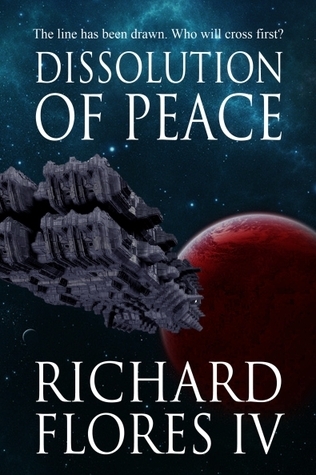 Today, I’m doing an interview with Richard Flores, author of Dissolution of Peace and editor-in-chief of Plasma Frequency Magazine, as part of his Dissolution of Peace blog tour. I’ve known Richard for a while via the Hatrack River writers forum, and I think you’ll enjoy what he has to say. At the bottom, check out the cover and blurb for his excellent book. Thanks for stopping by, Richard! When and why did you begin writing? I really began writing with serious intentions in 2003. That was when I wrote the original manuscript for Dissolution of Peace, though it had no title at the time. But it wasn’t until late 2010 that I really began to take getting published seriously. Why the sudden motivation? I’m not a hundred percent sure. But ever since writing in 2003, the idea of doing it called to me. I finally decided that I needed to do it. It was time I finally realized a dream after having several others not work out. What genre are you most comfortable writing? Science Fiction. This is what I read, this is what I love, and I think that’s why it is so comfortable for me. I’ve recently found myself enjoying a lot more Fantasy, so who knows maybe I should try my hand at it. After all stretching our comfort zone is what growth is all about. What inspired you to write your first book? Dissolution of Peace, my first novel, is largely inspired from the space operas and military science fiction that has come before it. The idea came to me in a passing thought. What if we had peace on Earth? What if the money the world spends on war was turned to science? That sparked the idea. Then I took it to the next level. Would we be able to abandon our “warrior ways” and if not, how long could we really stay unified and at peace? The idea snow balled from that. What do you consider the most challenging about writing a novel, or about writing in general? The most challenging part is what those outside the writing world think is the easy part, coming up with an idea. People seem to think that everything that pops into their head is going to be the next novel. But taking that fleeting idea and growing it into a novel takes a lot of work. What keeps the reader turning pages? An idea is a spark. Just as a spark doesn’t warm a room, an idea doesn’t make a story. Have you developed a specific writing style? If I have, I haven’t noticed. I’ve been told all my published works, the three short stories and this novel, are all very character driven. I enjoy my characters the most, so I can see why people see that. Perhaps that will become my writing style. What is your greatest strength as a writer? My willingness to learn has to be it. I am always reading new articles, books, and posts on writing. I participate in writing groups and workshops. Growth is a necessary part of this industry and I love to learn more about it. How did you come up with the title? Dissolution of Peace came to me after so much drama. The original title for the manuscript was “Serenity” after the main character. But, as the serious SciFi fans know, the movie of the same title took that. While the association with Firefly might have been good for sales, I didn’t want to make that false promise to the readers. Instead the name didn’t come until the 11th hour. I was using random generators and other things just to see words. While reading this long list of titles to my wife, none of which worked for me, the idea of dissolution (dissolving) peace really fit what I thought it was about. So I pitched the idea of Dissolution of Peace to my wife and editor. Eventually that was the title I stuck with. Christina Serenity is the Captain of the E.S.S. Australia, an Earth Naval vessel that suddenly finds itself in the critical points between the possibility of war between Earth and Mars. Serenity is a smaller woman, but she has a command bearing. She is respected by her crew, but the Earth Navy sees her age more. She is the youngest commanding officer of any Earth Navy ship. Serenity is a career driven woman and now that she has the command of a ship, she is happy to keep it as long as possible. Mike Carlson is a Corporal in the Earth Security Forces, the Earth’s global police force. He has been assigned to Protective Services, and protecting Captain Serenity, for some time now. He is a thin guy. He’s not particularly attractive or ugly. He is very committed to protecting Captain Serenity and does not plan to leave that assignment any time soon. Janice Kanter is an officer in Earth Security Forces and she was just assigned to be Carlson’s partner. She doesn’t care much for Protective Services, she only took a specialty assignment so she could eventually promote and return to a patrol assignment. She isn’t happy to get a military assignment, because that means a year or more working in PS. She also doesn’t care much for shuttle flights. Overall she is bright, an excellent marksman, and very good in defensive tactics. Is there a message in your novel that you want readers to grasp? Messages, to me, are something English teachers tell you an author meant so they can make homework assignments. I write my books with hopes to entertain and that readers will find their own special message in the novel. Novels should speak to each reader a little differently. How important do you think villains are in a story? Villains come in varying degrees. You can have a very likable villain and a much hated villain and everything in between. I absolutely think every novel has to have a villain of some type in it. What are your goals as a writer? I simply want to continue to produce novels and stories that people want to read. Eventually to a level that writing becomes all I do for a career.